Access Services facilitates the checkout of library materials, course reserves, interlibrary loan items, and technology/equipment. Access Services makes sure library materials are in their proper places on the shelves, manages library accounts, oversees library-wide lost and found, answers general questions, and opens and closes the building. 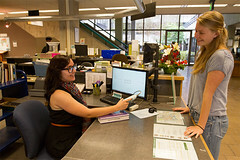 Access Services employees the highest number of student assistants of any library department. Yes! Wednesday! It's 12:47am right now.